Through the efforts of the family and friends of Robert A. Pritzker (IE ’46, Hon. Ph.D. ’84) and the Pritzker Institute of Biomedical Science and Engineering, the Biomedical Engineering Society Distinguished Lecturer Award was renamed in 2007 as a tribute to Robert A. Pritzker. The lectureship was designed to honor Pritzker’s dedication to the advancement of the biological engineering field. The purpose of the lecture is to critically review a field of biomedical engineering and offer a vision of its future. The Distinguished Lectureship is awarded each year to recognize an individual’s outstanding achievements, originality, and leadership in the science and practice of biomedical engineering. 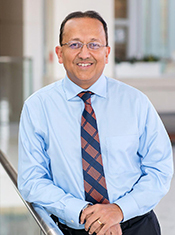 The Pritzker Distinguished Lecturer delivers a plenary talk at the BMES annual conference in the fall, followed by a presentation in the spring, on Illinois Tech's Mies Campus. Integration of biology, medicine, and fabrication methods at the micro and nano scale offers tremendous opportunities for solving important problems in biology and medicine and to enable a wide range of applications in diagnostics, therapeutics, and tissue engineering. Microfluidics and Lab-on-Chip can be very beneficial to realize practical applications in detection of disease markers, counting of specific cells from whole blood, and for identification of pathogens, at point-of-care. The use of small sample size and electrical methods for sensitive analysis of target entities can result in easy to use, one-time-use assays that can be used at point-of-care. In this talk, we will present our work on detection of T cells for diagnostics of HIV AIDs for global health, development of a CBC (Complete Blood Cell) analysis on a chip, electrical detection of multiplexed nucleic acid amplification reactions, and detection of epigenetic markers on DNA at the single molecule level. While the above mentioned devices are built with PDMS or silicon using microfabrication approaches, bio-printing with stereolithography can be a very powerful technology to produce bio-hybrid devices made of polymers and cells such as biological machines and soft robotics. Such complex cellular systems will be a major challenge for the next decade and beyond, requiring knowledge from tissue engineering, synthetic biology, micro-fabrication and nanotechnology, systems biology, and developmental biology. As these “biological machines” increase in capabilities, exhibit emergent behavior, and potentially reveal the ability for self-assembly and self-repair, questions can arise about the ethical implications of this work. These devices could have potential applications in drug delivery, power generation, and other biomimetic systems.